Contoured, thinly layered biotite-quartz-feldspar gneiss and feldspar-quartz gneiss with thin plates of biotite schist are found in the Farmington Canyon. This section is approximately 10 x 20 feet wide. When the summer heat sets in and you want to go rockhounding, what’s a person to do? In the Salt Lake City area, you head for the hills—more specifically, the Wasatch Mountains. These mountains are located at the convergence of the greater Rocky Mountains and the Great Basin region. The range reaches 160 miles from the Utah-Idaho border, south through central Utah. Today, 85% of Utah’s population lives within 15 miles of the Wasatch Mountains, mainly in the valleys just to the west (en.wikipedia.org/wiki/Wasatch_Range). With an elevation gain of 4,633 feet, the temperature drops 3.5°F for every 1,000 feet that the road ascends (https://sciencing.com/tutorial-calculate-altitude-temperature-8788701.html). That means when it is 90° in the city, it is 75° in the mountains. Many Utahans escape the summer heat by recreating in the mountains. 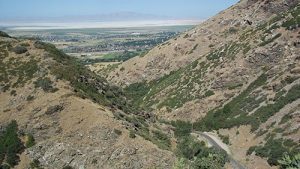 One place to go is the northern Skyline Drive, which is an unimproved road going through the Farmington Canyon Complex of the Wasatch Mountains. This little-known road clings to the top of the mountain range for 21.6 miles. It starts in Bountiful at the south end and comes out in Farmington at the north end. With only two entrances/exits, Skyline Drive is a dirt and gravel roadway about two lanes wide. Note the words “about two lanes wide”. If you are not comfortable with heights, do not attempt this drive. When two vehicles going in opposite directions try to pass each other, one is going to be pressed up against the hillside and the other will be on the very edge of the dirt road. There are pull-off areas, but you must plan ahead. Travel time is approximately an hour and a half with no stops. Once you start on Skyline Drive, it will be 21.6 miles before you arrive at the other end. Check the weather reports before your drive. As part of the Wasatch National Forest, Skyline Drive is open from late May through the end of October. Even in August, there are snowdrifts at the higher elevations. Check the road conditions with the U.S. Forest Service before you go (www.fs.usda.gov/activity/uwcnf). A variety of colors is found in the metamorphic rocks along Skyline Drive. This is caused by trace amounts of iron, magnesium and chlorite. Formed over 2.6 billion years ago, this area was mainly sedimentary rock that was turned into metamorphic rock by heat and intense pressure, leaving very little of the original rock. 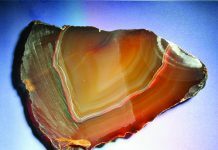 Depending on the composition of the original rock, gneiss, schist, garnet, granite, feldspar or mica was created. 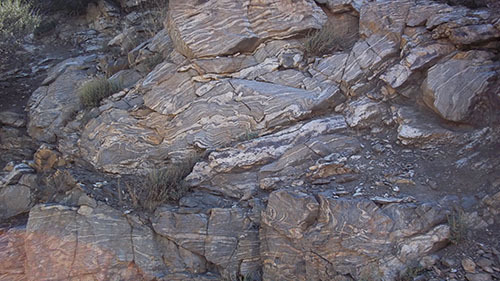 The twists and turns of the folded gneiss can be seen in the white, gray and brown layers. The schist has a shiny, silvery look and may contain tiny, red garnets. (https://pubs.usgs.gov/pp/1476/report.pdf, Bryant, B. (1988a) Geology of the Farmington Canyon Complex, Wasatch Mountains, Utah, USGS professional paper 1476, page 11). Bring your jeweler’s loupe along to check for any soccer ball-shaped crystals. Amphibolite containing hornblende, actinolite and plagioclase can also be found (https://en.wikipedia.org/wiki/Amphibolite). In Farmington Canyon, there are some igneous (pluton) rocks that crystallized from magma cooling slowly below the surface of the earth. Depending on their size and shape, plutons are given specific names like sills, batholiths, laccoliths, stocks, dikes, lopoliths, and other igneous formations (https://en.wikipedia.org/wiki/Pluton). 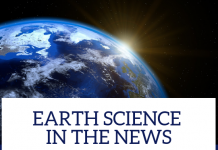 To recognize plutonic rock, look for mineral grains 0.2 inch or less in size. The grains are roughly equal in size, and the rock looks like granite. These grains don’t generally have well-formed crystals because they grew so closely packed together. The Farmington Canyon Complex also contains migmatite, which is a mix of metamorphic rock and igneous rock. It is created when a metamorphic rock partially melts, and then that melted rock recrystallizes into an igneous rock, creating a mixture of the unmelted metamorphic rock with the recrystallized igneous rock. The migmatite itself has a variety of rocks layered and folded into each other. Most exposures show distinct layering, but a few are well blended. In some rocks, lenses of quartz and feldspar-rich garnet, biotite, and/or hornblende-rich portions are well developed. 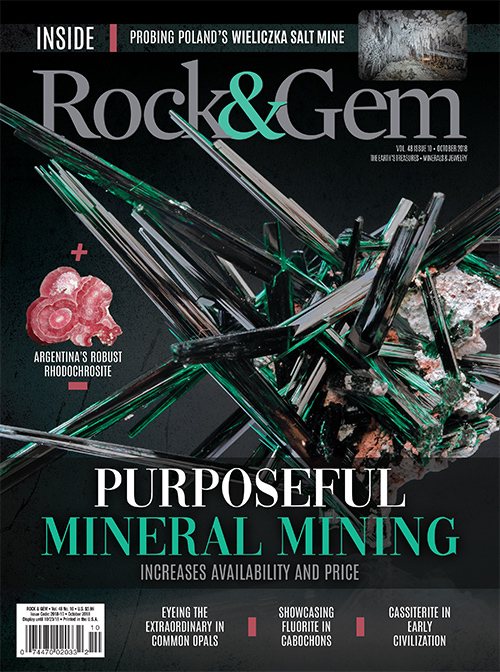 In some nonlayered rocks, minerals rich in magnesium and iron form irregular lumps (https://pubs.usgs.gov/pp/1476/report.pdf, Bryant, B., page 11). As you explore Skyline Drive, the mixture of metamorphic, igneous and migmatite rock will stimulate your rockhounding spirit. Located west of the Wasatch Mountains and Skyline Drive, Interstate 15 is the north-south roadway that takes most travelers to their destinations. To reach the southern start of Skyline Drive, travel north from Salt Lake City to Bountiful on I-15. Take Exit 317 onto 400 W. North and follow this road east for 3.4 miles as it turns into 400 E. North. At N. 1300 East, make a left-hand turn and follow the road as it climbs up into the foothills of the Wasatch Mountains. Once you pass the houses, the road surface turns from pavement to gravel and becomes Skyline Drive. The road does a switchback turn and heads northwest. From the ridge on Skyline Drive, the Great Salt Lake and surrounding cities can be seen. Antelope Island is 23 miles off. Set your mileage marker here to measure the distances to the rockhound stops. Traveling south on I-15 into Farmington, take the Park Lane exit (Exit 325) toward state Route 225. Turn left onto Route 225/Park Lane. Turn right onto N. Main St./state Route 106. Take the third left onto W. 600 N. Turn left onto 100 N. East/Farmington Canyon Road and stay on this road as it becomes N. Skyline Drive. It then merges into Skyline Drive. As the road goes over small bridges, with a mountain stream rushing by underneath, you will feel the temperature drop. The stream is fed by snowmelt from the upper areas. The landscape is now wooded and shady. This is a typical northern Utah forest with Gambel oak, white pine, water birch, and canyon maples. The wildlife includes deer, elk, moose, fox, coyotes, rabbits and squirrels (www.fs.usda.gov/activity/uwcnf/recreation/natureviewing). Skyline Drive is used for many activities: hiking, ATV and dirt bike riding, target practice, etc. 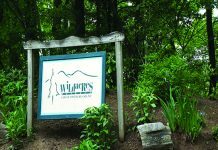 Two campgrounds, cell towers, and radar/microwave systems are located on the side roads. Another side road will take you to an east-facing overlook. Stay on the main road for accurate mileage measurement. All mileage is noted from the Bountiful entrance onto Skyline Drive. Proceed 1.5 miles on Skyline Drive. For the next 6.5 miles, pink and white feldspar can be found in the loose rock on the hillsides. Watch for the color change and make random stops to check further. The feldspar is easy to identify by its color and the right angles where it cleaved apart. In the loose rock at 3.0 miles, mica schist is found on the hillsides. Mica schists are among the most common metamorphic rocks. The silvery metallic or coppery color makes the schist sparkle in the sunlight. The individual mineral grains in schist, drawn out into flaky scales by heat and pressure, can be seen with the naked eye. Schist is usually foliated, which means that the individual minerals flake off easily into small pieces or slabs. Schist often contains tiny garnets. Schists are also named for their primary or unusual mineral content. A mica schist subgroup is the cordierite, kyanite, enstatite and sillimanite schists. 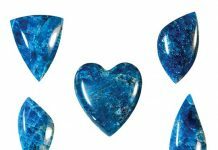 Cordierite, kyanite and sillimanite can be colored blue; kyanite, enstatite and sillimanite can be white. 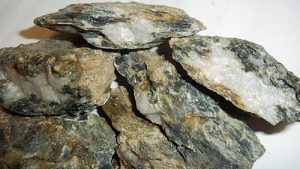 Except for kyanite, the other three minerals can be gray, green-yellow or brown (https://en.wikipedia.org/wiki/Schist). Use your rock identifying skills to determine which mica schist you have found. All four minerals are common metamorphosed sedimentary rocks and are found in Farmington Canyon (https://pubs.usgs.gov/pp/1476/report.pdf, Bryant, B., page 14). On the Mohs hardness scale, schist has a hardness of 4.5–7.0 and would make an interesting lapidary material. Also at the 3.0 miles mark, trigonal-rhombohedral chunks of calcite are in the loose rock. With contorted layers of biotite, quartz and feldspar, this gneiss resembles a petrified log. (12 x 3 x 2 feet). The sharp-angled cleavage makes the calcite stand out from the weathered metamorphosed rocks. Softball-size pieces have been found. The color varies from white to orange due to mineral staining. You should explore the hillsides for nice specimens. Skyline Drive makes hairpin turns as it hugs the top of the mountain range. The mountain streams come rushing down the canyons and make a cool oasis for a lunch break. Many streams are only 3 to 4 inches deep; the water is ice cold and perfect for wading. At 10.9 miles, the hillside glitters in the sunshine. Mica flakes are scattered everywhere in the dirt. The common mica variety muscovite is silvery white and can be found in small “books” here. Just like pages in a book, this mica will separate into individual sheets that are paper thin. Books ranging from ½ x ½ x ¼ inch to ½ x ¾ x ½ inch have been found. Some mica is still in the matrix. The road has been graded and the subsoil of the hillside is exposed. Dig just under the soil line to find the larger pieces. At this point, you’ve reached the highest point on the drive. In an alpine climate, the surrounding hillsides are all above the tree line. Look westward to see I-15, cities, and the Great Salt Lake spread out down below. Antelope Island is 23 miles off in the distance. With no trees to block your view, batholiths (large masses over 40 square miles), stocks (smaller than 40 square miles), dikes (cuts across older rock layers), sills (parallels rock layers), laccoliths (domed rock layers), lopoliths (depressed-domed rock layers), and other igneous formations are easily visible in the Wasatch Mountains. At 19.6 miles, find a safe spot to pull over and park. In a thin layer that’s almost like a spiderweb, dark golden-colored mica coats the white rock on the hillside. Also known as magnesium mica, phlogopite is a yellow, greenish or reddish-brown member of the mica family. It is common in metamorphic rocks. 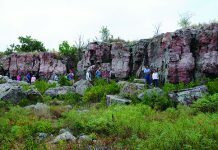 Look for the main outcrop to get the best specimen (https://pubs.usgs.gov/pp/1476/report.pdf, Bryant, B., page 26). Mica is a subgroup of the sheet silicates, which are known for their flakiness. 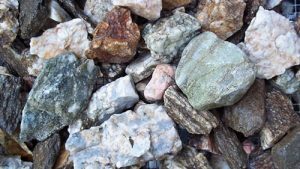 A few mica varieties are fuchsite, lepidolite, margarite, glauconite, biotite, muscovite and phlogopite. Biotite is a black mica and is used to determine the ages of rocks by either potassium-argon dating or argon–argon dating. Muscovite, called common mica, is white or silvery. Both form in the same rocks and, in some instances, side by side. Phlogopite is a yellow, greenish or reddish-brown member of the mica family (https://en.wikipedia.org/wiki/Phlogopite). The three micas are found in the Farmington Canyon Complex (https://pubs.usgs.gov/pp/1476/report.pdf, Bryant, B., page 26). Shortly after you meet back up with the paved road at 19.8 miles, there is a gravel parking area on the left-hand side of the road. Hiking trails lead down to Farmington Creek or up into Farmington Canyon backcountry. Across the road from the parking lot, there is a hillside of metamorphic rock. With contorted layers of biotite, quartz and feldspar, some gneiss resembles petrified wood. One piece was over 12 feet long and had a rounded, loglike appearance. 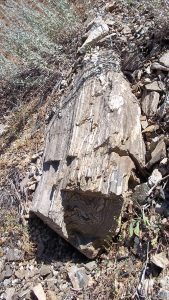 The layers were wrapped around to resemble a tree’s growth rings. It will fool you at first glance. Take the time to explore the area for the different varieties of metamorphic rock. The last 2 miles of Skyline Drive, which take you out of the forest and back into civilization, are paved.